Designed to save space and minimally impact Mother Earth this monitor is super slim, and leverages various energy-saving, Earth-friendly technologies, including white LED backlighting, ENERGY STAR® compliance, and more. VESA Mount: Save space and add drama to a room by putting this display on a wall. VESA mounting makes it easy. Full HD: 1920x1080 resolution in a 16:9 aspect ratio makes movies more real and dramatic. Small details and text are clear. 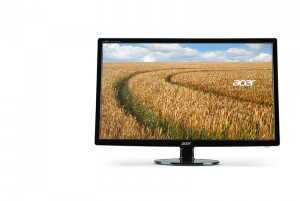 Acer eColor: Easily adjust display settings to best suit whatever you're viewing – data, media, movies or photos. This item is only available to customers in the United States. Most will receive this item within 1-5 business days when selecting UPS or equivalent shipping options. This monitor is supported by both recent and older distributions and releases on any computer with an HDMI, D-Sub (ie VGA), or DVI port.